While trying to whiten your teeth, have you encountered tooth sensitivity? If so, then what you might need is a Non Abrasive Toothpaste. We all want whiter teeth. But, how much pain are you willing to put up with to get to that super bright whiteness? Luckily, there are ways to fight tooth sensitivity while still whitening your teeth. Do You Want the BEST Non-Abrasive Toothpaste? Is your enamel being affected by your teeth whitening methods? Is what you eat contributing to the problem? Are your brushing habits detrimental to your teeth? Is your vitamin intake helping or hurting your teeth? Well address each of these issues and provide some suggestions for ways to avoid the pain. 1 Are My Teeth Whitening Methods Bad for Me? 2 I Like It Hot! Are My Teeth Whitening Methods Bad for Me? Some teeth whitening methods are better than others in terms of causing tooth sensitivity. Many of the best whitening methods are harsh. If you don’t have great enamel to begin with, they can just send you into nerve hell. The best way to offset a good whitening method is to build up your enamel. In this article about vitamins for teeth, we wrote about some great vitamins that can be used to build up your enamel. Be sure to give a good vitamin several months or even closer to a year to prove its effectiveness. For some whitening methods, until you can build up your enamel you might want to reduce the chemical (usually hydrogen peroxide or a derivative) being used. So, if your white strips contain 20mg of hydrogen peroxide, you should try to cut that number in half for several weeks to see if you see a difference. You might like your food hot. But, that extra spiciness might be affecting your teeth. Try to reduce the amount of acidic foods you eat for several weeks to see if your teeth improve. Some fruits also are high in acid and can be bad for your teeth. A quick Google search on that food you’ve been packing in your lunch might be enlightening. Would you use sandpaper to clean your teeth? One of the top reasons your teeth can become sensitive is that you’re simply brushing them too much or too hard and using something that is abrasive. Enamel is a tough substance. But, it does have its limits. If you don’t have strong heredity on your side in terms of thick enamel, and you aren’t supplementing your diet by choosing the right foods and/or vitamins, then you may need to tone down the brushing. One great method to use is to reduce the abrasiveness of the toothpaste you are using. So, ask your dentist for a soft toothbrush, and use one of the Non Abrasive Toothpaste products below. Give them a couple of weeks and see if they make a difference. CariFree provides this toothpaste that is recommended by dentists. The product has been low in stock numbers lately. So, you might need to hurry before they run out. 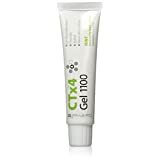 CTX4 Gel 1100 is Gluten free. It is not only non-abrasive, but it includes reminerialization ingredients. These features can help to rebuild enamel that has lost some thickness. One benefit of this toothpaste is that it includes special pH balance technology that actually neutralizes acid foods. Many reviewers of this product talk about having fragile teeth. They describe how well this toothpaste works on maintaining their teeth. One reviewer stated ” Hardly any plaque sticks to your teeth if used any each day and my teeth are very fragile but have done great the last few years”. Many reviewers also commented on how great the minty fresh flavor tastes. On Amazon, ZERO reviewers have given 1 or 2 star reviews. That is extremely uncommon. If this toothpaste even tasted a little strange, you’d see at least one or two bad reviews. 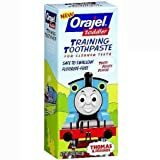 If you’re looking for a great toothpaste for your toddler, and want to keep the abrasion factor low, Orajel provides this fun product. Your kids will love the taste of this toothpaste. And, since you’re wanting to protect your child’s tiny teeth (along with everything else about your child), then you will want this toothpaste. It is built to be kind on the tooth while still getting the job done. Being a toothpaste that targets children, Orajel has made sure all of those harmful chemicals like gluten, fluoride, dairy and sodium lauryl sulfate are not in this toothpaste. With Thomas the Tank Engine on the product, kids just love it. With the great taste and image friendly pictures, parents have to control this toothpaste tube. Otherwise, kids will go through it like they would a bag of candy! Bedrock & Bloom provide this very popular non-abrasive toothpaste. Hundreds of Amazon reviewers love this product and rave about it in the reviews. We’ve talked about Tooth Powder products before and found them to typically be abrasive. However, this special formula of tooth powder almost magically avoids being gritty while brushing. Yet, it still is able to remove stains and fights cavities, bacteria, plaque and gingivitis. 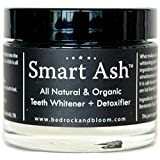 This tooth powder also includes ingredients (like Smart Ash) that remineralize your teeth. So, not only is it a Non Abrasive Toothpaste, it can help build up your enamel. This tooth powder also hits all of the keywords you want to see as an individual with strong feelings about world pollutants. This product has been purchased by many customers and has stood up as a superior product. In this article we discusses the reasons why an abrasive toothpaste can be harmful to your enamel. Hopefully, you found our research useful and can use it to produce a beautiful, healthy smile. Now armed with the proper information, you can take the appropriate actions to reduce your teeth sensitivity. We think that your tooth arsenal will be more effective if it includes the best Non Abrasive Toothpaste.